In subtracting 1-digit number we will subtract or minus two one-digit number and find the difference between them. The symbol – is called the minus sign and shows that the number written after it is to be subtracted, or taken away, from the number written before it. We may read 6 – 2 = 4 as ‘six minus two is equal to four’ or ‘six less two is four’. How to subtract two one-digit numbers? 1. Here we will find 2 – 1. (i) 2 – 1 means start with 2 and take away 1. (ii) From 2 strokes we take away 1 stroke and cancel the strokes. (iii) So, 1 stroke is left. We may read 2 – 1 = 1 as ‘two minus one is equal to one’ or ‘two less one is one’. 2. Here we will find 5 – 3. (i) 5 – 3 means start with 5 and take away 3. (ii) From 5 strokes we take away 3 strokes and cancel the strokes. (iii) So, 2 strokes are left. 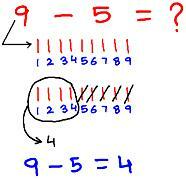 We may read 5 – 3 = 2 as ‘five minus three is equal to two’ or ‘five less three is two’. 3. Here we will find 7 – 2. 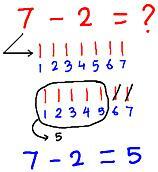 (i) 7 – 2 means start with 7 and take away 2. (ii) From 7 strokes we take away 2 strokes and cancel the strokes. (iii) So, 5 strokes are left. We may read 7 – 2 = 5 as ‘seven minus two is equal to five’ or ‘seven less two is five’. 4. Here we will find 9 – 5. (i) 9 – 5 means start with 9 and take away 5. (ii) From 9 strokes we take away 5 strokes and cancel the strokes. (iii) So, 4 strokes are left. We may read 9 – 5 = 4 as ‘nine minus five is equal to four’ or ‘nine less five is four’. 5. Here we will find 8 – 8. (i) 8 – 8 means start with 8 and take away 8. (ii) From 8 strokes we take away 8 strokes and cancel the strokes. (iii) So, 0 strokes are left. 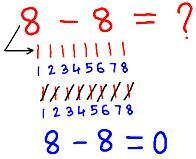 We may read 8 – 8 = 0 as ‘eight minus eight is equal to one’ or ‘eight less eight is one’.